Arabizi is a mix of Araby and Englizi, which stands for Arabic and English. It is an informal written language where native Arabs transcribe their dialectal mother tongue in text using Latin alphanumeral instead of Arabic script. For example the expression يلا حبيبي which means common darling transliterates to yalla 7abibi. What makes it a challenge for NLP? The way it is expressed in text is esoteric to each region in the Arab world, because each region have its own spoken Arabic dialect. It lacks a unified orthography where a single word might be spelled differently. It is found in multilingual streams of text and users tend to mix it with other languages: Hi, Kifak Cava? The famous trilingual Lebanese greeting! Different Arabic Dialects for the words: Smart and Dumb. Researchers in the Arabic NLP perceive Arabizi as an Arabic language therefore they try their utmost best to transliterate Arabizi to Arabic, which in many cases results in broken Arabic because there is no orthographic consistency and different letter representations are used interchangeably. 7abibi (darling) could be written as: 7abibi or habibi or even hbb, easily interpreted by humans but a transliterator might confuse the 7 and the h since they map to two distinct Arabic letters حبيبي, هبيبي, هبب. Therefore, accurate transliteration requires lots of training and large parallel corpora. There are online tools that transliterate Arabizi to Arabic (Yamli, and Google Input Tools ) however they are designed to help people output formal Arabic text using an English keyboard, where they provide a list of possible options for every input word. These tools are not designed to transliterate whole chunks of text. Automatic transliteration of whole text produces broken Arabic text. The goal of this project is to provide Arabizi resources, free of charge, to the NLP community in general and to the Arabic NLP in specific to process and analyse Arabizi data. In this work we provide statistical insights about the usage of Arabizi on Twitter across Lebanon and Egypt and we create a classifier that identifies Arabizi from multilingual Twitter streams. Please cite our paper in your research. 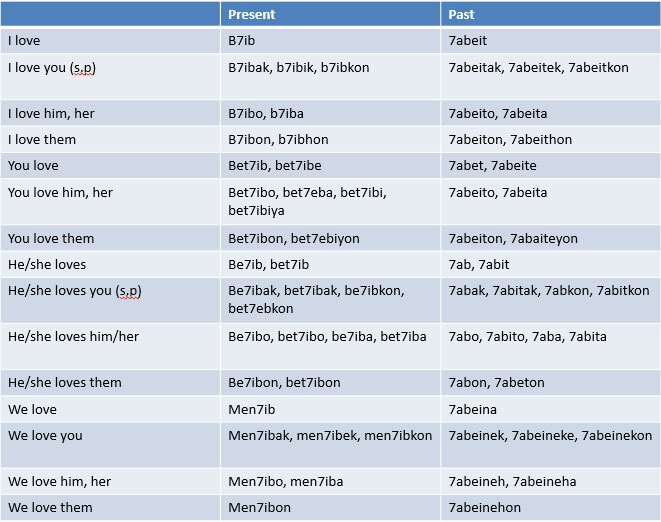 We are creating and evaluating multi-dialect data resources for Arabizi that will be released soon! If you have any question about this work or wish to collaborate or contribute, we are happy to listen to you and assist wherever possible.